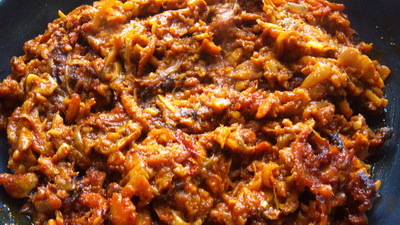 Bhuri Bhuna / Spicy Beef Stomach is an unique recipe which is cooked with lots of spices and specially lots of garlic. Though I saw a troublesome cleaning process of Beef Stomach and even more longer process to cook it. But we get cleaned beef stomach here and Pressure cooker makes cooking process shorter. 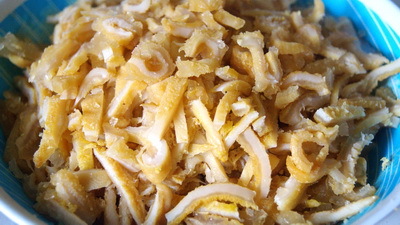 If you want, you can boil the beef stomach 5-6 days long like our elder and slice it and then cook it. I promise that this short process will not effect on taste. You cannot able to find difference. Hope in your busy schedule, the recipe will spice up your life. 1. Clean the beef stomach well 5 to 6 times with hot water and boil them with ½ teaspoon turmeric, 1 bay leaf and ½ tablespoon salt. I prefer to use pressure cooker to boil he stomach. It will need 4 whistles to boil the beef stomach. 2. Let it cool down and slice them into smaller pieces like the picture. Keep the water from the stomach. 3. Heat oil in a pan and brown the onions. 4. Add the cinnamon, cardamom, cloves, bay leaf, onion, ginger, garlic, pepper and salt. Cook it till oil is separated. 5. Now add in the stomach pieces and mix well. 6. After a few minutes add the rest of the ingredients except for the roasted cumin powder, and green chilli. 7. Keep stirring for 2 to 3 minutes. 8. Add the water from stomach and cover the pan and keep over low heat. 10. Once the water dries up, add green chilli and cumin powder. 11. Cook 2 more minutes and turn off the heat. 12. 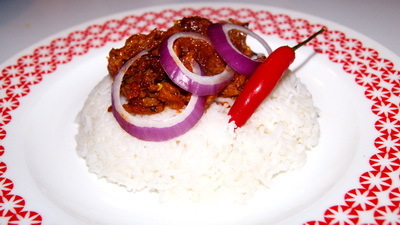 Serve Bhuri Bhuna / Spicy Beef Stomach with plain rice. Tips: you can boil the beef stomach, sliced it up and keep it in freezer for long. If I don’t boil the stomach in pressure cooker then how long it has to boil in normal? It will take at least 3-4 hours. Thanks. Wow I tried and it turned nice and my husband loved it!!!!! Hi Raunak! all your recipes are really yumm. I have tried quite a few and liked them all. Could you please let me know how to make mutton kalia? Hi! regular mutton curry is actually called Kalia. I will try to post soon.Thanks. I’m gonna try to cook the bhuri now..thank u Apu for your detailed recipe..someday I think we would love to see your own cooking show.. :). And free tickets to the front.. :D. I live here in USA..